So a couple of us are having the debate... I have the typical two post lift with the four adjustable arms for positioning. I always thought you lifted these cars with the doors closed to maintain the integrity of the structure, in case there is more weight in one direction or the other. Others are telling me I should leave the doors open when I raise the car. What are the thoughts of others on this issue? I was told that if you use the bumper jack ( I know), or lift the car from the frame from the front or back, to open the doors because the body may bow and pinch/crack the paint at the top rear of the door. I have never heard to leave the doors open,on anything other than,other model corvettes. The bumpers are bolted to the frame. When you jack or lift the car from the frame it should not affect the body at all unless the frame is not structurally sound. I see absolutely no reason to leave doors open. Now if you were talking unibody construction (like a Mustang, Camaro and pretty much anything manufactured after 1980) then it would be possible to twist a body if you were jacking at one corner. That is why they were designed with reinforced lift points under the sides of the cars and they supplied a scissor jack for that purpose. When I have my car on the lift the doors are shut. Why would you have the doors open? It's an old wife's tale. The person who told you could have had a weak frame...Here's mine on the lift I never had a problem. Thanks everyone for your responses. I generally leave my doors closed. I am like the one post, as I have opened one while on the lift to turn the power on or shift it in neutral, but generally I keep them closed. X frame cars are one of the strongest designs for four point lifting, so I was surprised when two of the people I was with said I should lift with them open. I was like why? And better yet what difference does it make. It's an X framed car. If you already knew the X frames were strong, But I guess you wanted to hear from the forum. Which is fine we are here to share information and help one another. 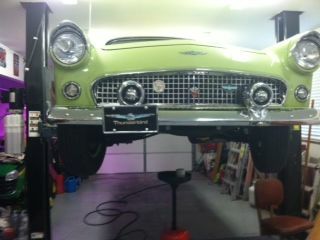 I'am in the middle of helping my neighbors brother restore his 56 t Bird. It's a complete frame off restoration build. Keep asking I like to find the answers for this forum. Not to divert course too much but does anyone have a four post that they put the tbird up on for storage? I know the 2 post is great for working underneath but would like the option to store it and park another car underneath. Wondering if the four post precludes you from working underneath in some places? Old girl is a bit incontinent too so that’d have to be taken in consideration for whatever was parked underneath potentially. Thanks. I don't have a four post lift. Mine is a two post lift. I am currently storing a car up on the lift for this winter. No issues. I just made sure the stops (to stop the car from coming down) were set when I put it up. I know if I had a four post lift it would be difficult to do a brake job, exhaust or any work on the axles / spindles. I've also heard there are braces or panels that go across under the car on a four post lift. I would think it could be difficult to get at some areas under the car if the panels just happen to be right where you want to work. As you can tell I am a proponent of the two post lift over the four post lift. The only thing regarding a four post lift that I can think of as an advantage is that I've seen four post lifts that can be moved around in the garage bays. I bought a pad at pep boys that is designed to put under cars that are parked long term and capture any oil drips. The top of the pad is sort of a felt like material and the bottom has a plastic or vinyl surface to stop any oil leak through. I put that pad on top of the car that is under the car on the lift. That way if the car on top drips anything it doesn't bother the car underneath. I have a four post lift that I use for storage. It is a BendPak HD-9 with a 9000 lb. capacity. It is very useful for both storage and maintenance. I forgot to mention there are four drip trays underneath to protect the bottom car. Nice set up, You have the perfect lift ! I have a scissor-type Bendpak 4 point lift that I use for my cars. 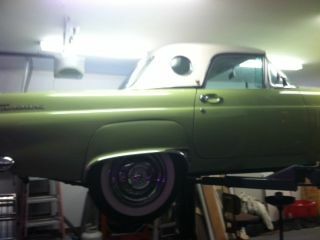 I typically keep the doors closed when I lift the T-birds, especially the 90 SC. I never have an issue of opening and closing the door if needed while it is up on the lift. When the doors are open there isn't much room to maneuver around the car so they are closed most of the time. I would love to have a four-post drive on lift, but I don't have the ceiling height.